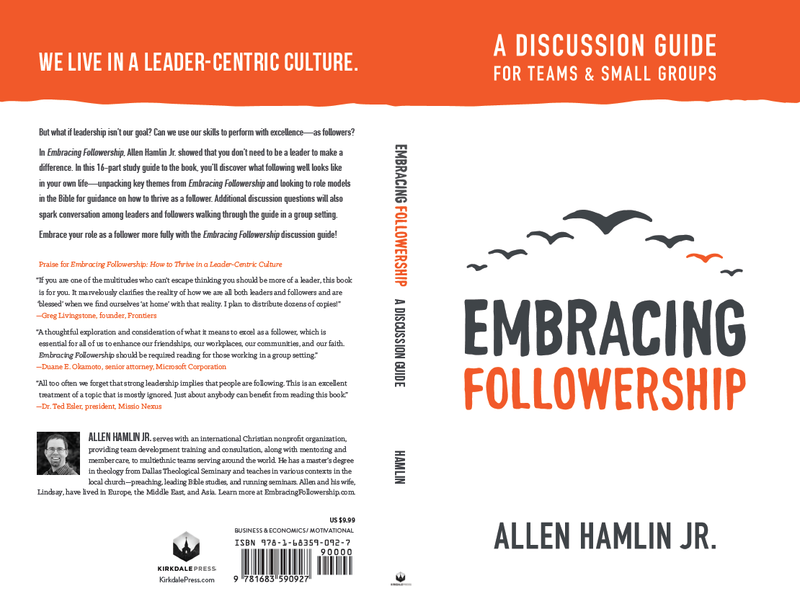 Following-up on the release of Embracing Followership: How to Thrive in a Leader-Centric Culture (Feb 2016), author Allen Hamlin Jr has released a companion volume, Embracing Followership: A Discussion Guide for Teams & Small Groups. Available from Kirkdale Press since December 19th, 2017 in print and various eBook formats (see header above, and buttons below for links). The original book did much to surface some of the internal and personal realities of our followership—overcoming misconceptions, taking ownership, and engaging in personal development. There was also a consistent thread of the importance of relationship, both with one’s leader(s) and with one’s fellow followers, as crucial aspects of following with excellence. Taking the next step in Embracing Followership necessitates moving from an individual journey into a relational context to be challenged, inspired, and encouraged as you explore the application of these ideas into your workplace, team, and community involvements. This robust, 140-page discussion guide provides a bridge into this next step, with plenty of material for ongoing personal reflection as well as group dialogue about 12 of the key themes from Embracing Followership. Suitable for a book club, community-based home meeting, or workplace seminar, it offers a menu of new and flexible content derived from the Bible, other authors, and personal experience, that can accommodate groups of various sizes with various time constraints. Christian readers will especially benefit from the extensive facilitator’s notes related to the exploration of a number of Bible passages related to each of the topics, along with four followership character studies of biblical figures. You’ll note that the Discussion Guide’s title says that it’s for “Teams & Small Groups“; what’s the difference? 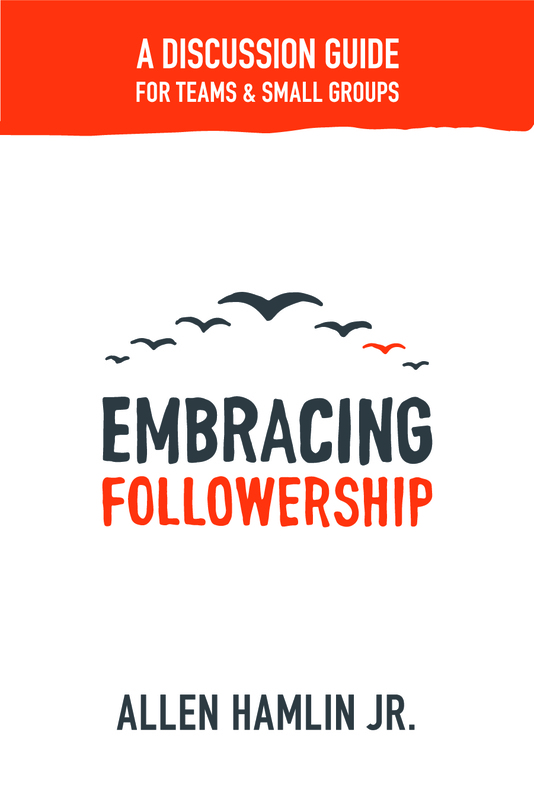 We’ve explored that in a blog post, offering a reflection on the different environments within which you might engage in embracing followership! The discussion guide itself is supported by additional free resources found on this website, with each session tied to a number of related blog posts, and there are worksheets and supplemental activities available for easy printing and download. See the Companion Resources page for more! Whether you’ve already read the original book, or are beginning to think about moving forward with embracing followership in your own life, this discussion guide will be an invaluable resource to further guide you into contributing your very best to the groups, projects, and endeavors that you’re a part of! Read an endorsement of this new book from executive coach Dr Tom Lambshead. And sample a complete study (#8) along with facilitator’s notes! See the Ordering Info page for links to find the original book, Embracing Followership: How to Thrive in a Leader-Centric Culture. Deeply discounted bulk orders can be arranged by contacting Scott Hausman, or our distributor, Bookmasters. preview the content and download a Kindle sample using Amazon’s “Look Inside” feature now! integrated with free resources on this website! download a complete sample study!